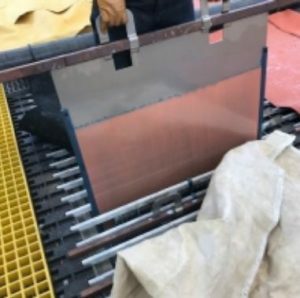 ARIZONA – Taseko Mines of Vancouver has produced the first copper from production test facility at its Florence mine midway between Phoenix and Tucson. This is an in situ project with 24 injection, recovery and monitoring wells. The pregnant solution is piped to an SX/EW plant to produce anodes. The company says that over the past three months about 1.5 million tonnes of underground copper ore has been contacted with leach solution. Taseko president and CEO Russ Halbauer said the company has been advancing the project to commercial production since it acquired Florence Copper in 2014. He expects to have a financing package in place so that construction can start on the commercial plant in the next 12 months. Scale up of the recovery process has been relatively seamless, he added. The Florence project is produce about 85 million lb. of copper annually for 20 years at an average operating cost of US$1.10 per lb. Probable reserves total 345 million tonnes grading 0.36% copper for 2.5 billion lb. of the red metal. The deposit has 429 million measured and indicated tonnes averaging 0.33% copper and containing 2.8 billion lb. The inferred portion is 63 million tonnes at 0.24% copper for 300,000 lb. Additional details about the Florence project are available at www.TasekoMines.com.